For some reason, very early on the lake was seen as an opportunity for dumping garbage. Minutes from the April 5, 1907, Village Council meeting refer to the Bass Lake public dumping ground. More abuse took place in 1908, when County Ditch #14 was dug between Bass Lake and the smaller Lake Calhoun, paid for by assessing the owners of adjacent property. One reason given for draining Bass Lake was to raise the level of Lake Calhoun, perhaps as a result of a request by the Minikahda Club to use Lake Calhoun to water its grounds. Reportedly the County would only assent if the level of Calhoun was raised. A different reason given was that Charles Hanke wanted it drained for residential development. This proved infeasible, however, due to the nine natural springs. To this day, some say Minneapolis “stole” the water from Bass Lake. The Milwaukee Road completed the Bass Lake yard in 1913, with 27 tracks and a capacity for 2,000 rail cars. Fill from the construction of bridges in Minneapolis was used. The yard existed until the 1970s, and is now the Park Glen area south of the tracks. After the lake was drained, it became an officially designated dumping ground. The Village started it by dumping concrete in there, and the City of Minneapolis was also using it as a dump. One cryptic note from the Village Council Minutes: on May 26, 1921, the Chicago, Milwaukee, and St. Paul Railway Co. stated that the Bass Lake Dump had been “taken care of.” In 1928 permission was granted to again drain Bass Lake at the site of the new (1926)Minikahda Oaks subdivision on former Hanke land (behind Al’s bar, now the Ellipse). In 1946 the lake was a mess. Signs against dumping were disobeyed, some say even by the Village and by the City of Minneapolis. A Dispatch article described it as a breeding ground for mosquitoes, with deep holes and an unfixed shoreline. A major effort to restore the lake to its former splendor took place in 1946, supported by citizens groups like the Sportsmen’s Club, but the Village threw legal obstacles in their way, saying the 1,000 households assessed for the ditch would have to be reimbursed. Even though a real estate firm would have paid for it, the effort had to be abandoned. The neighbors continued to request action; in December 1952, J.F. LaSalle, President of the Minikahda Oaks Association, made a request that the swampy eyesore of a lake be dredged. He was referred to the County Highway Engineer. The dumping and infill continued in the 1950s. Acme Stone and Lumber operated on 8-10 acres at 3200 France Ave., in a deep hole that may have been the lake bed. Sand would be hauled up on a conveyor belt and then made into concrete blocks. It proved a tough job to keep the young boys living in nearby Minikahda Oaks away from the “sand pit.” In 1951 Acme’s owner was listed as Mary K. Peterson. the lowlands east of County Road 18 (now 169) and south of Cedar Lake Road. In 1960 developer Douglas Rees offered to sell 35 acres of the Bass Lake Meadow to the City in exchange for permission to keep 8 acres and build a large apartment court. In 1960 acquisition was in process: 43 acres were offered for $60,000, but the Parks and Rec Advisory Commission recommended that consideration be given only to the 35 lesser acreage for an “impounding area.” By the 1960s office buildings had been built on much of the site, and the rest was still full of garbage. In 1965 the council heard two requests to dump clean fill in the area. A 1981 note says that it was a ponding center for central storm sewer system. 5.5 acres were filled and leveled off, top soil was brought in, and it was seeded for an athletic field. These undated photos (perhaps from the 1950s) show Bass Lake totally devoid of water. The first one is looking north toward the Robin Hood Flour grain elevator which sat on the tracks. A group of residents fought hard to protect the lake from any further damage, which resulted in an anti-dumping order in 1969, supported by George Haun, then director of Parks and Recreation. Plans were made to restore the area left into hiking trails and raise the water level. A woodchip trail was built but the City didn’t follow through, and the dumping continued, even by the City itself. The City did remove silt in 1972 and a student cleanup crew pulled garbage from it in 1976. An article from 1978 described the deplorable conditions that still remained, and a panoply of proposals that stretched the confidence of those who still fought for the integrity of the lake. By then, the Westwood Hills Environmental Center had been finished, and it was used as an excuse not to create another wildlife area. But finally the City took responsibility for the lake; silt was removed in 1992. 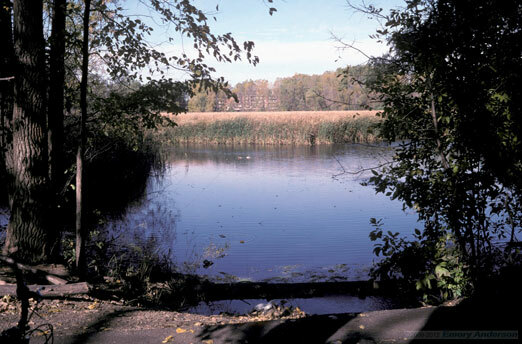 Today it is called the Bass Lake Preserve, a protected wetland. The City actually owns the lake, although management is regulated by the State Department of Natural Resources and the Minnesota Pollution Agency. Preliminary studies are being done in 2014 to determine the feasibility of restoring Bass Lake. Project goals are to create open water areas, improve aesthetics, manage flooding, and manage vegetation. As a wetland it is protected, but if it can be shown that it was originally a traditional lake, the case could be made that restoration is true to its history. This once mighty lake has taken decades of abuse, but hopefully our descendants will see that it is preserved. The George Haun Trail is named for the man who served as the Director of the City’s Department of Parks and Recreation for over 20 years. The 1.4 mile trail was constructed around Bass Lake in the fall of 1987 and was named in Haun’s honor upon his retirement in January 1988. At the time it opened, it was the longest single-site uninterrupted trail in the City. N.B. What force created Minnesota’s lakes? Although some ascribe to the theory of Paul Bunyan’s blue ox Babe’s footprints, a better guess is that they were formed during the Ice Age when glaciers moved back and forth across the state. Large ice fragments became buried under layers of dirt, and eventually they would melt. The dirt would collapse and leave holes in the ground that filled with water.